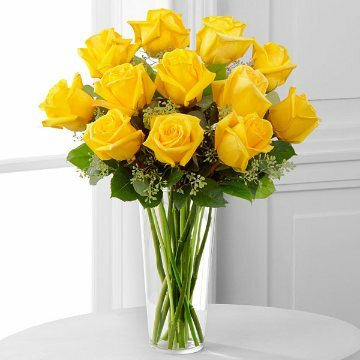 Send a classic yellow roses bouquet. 12 Yellow Roses with Vase. Sunny yellow roses are a cheery and wonderful gift. Celebrate a birthday, anniversary, graduation or any occasion with this lively bouquet arranged with seeded eucalyptus in a clear glass vase.